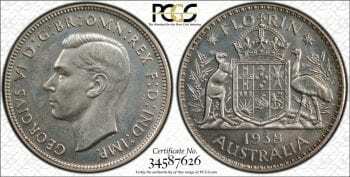 Rare Australian 1938 Silver Proof Coin Set. Being Sold as a Collection. 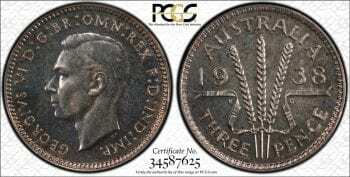 Coins Description: The Australian Pre Decimal 1938 Silver Coin Collection. Set Comprises: Three Pence (3d), Six Pence (6d), One Shilling (1/-) and Two Shilling (2/- or Florin). Grading: PR64 PCGS Graded and Slabbed. Notation: It is a rare opportunity indeed when such a superb and rare set of Proof Coin Set becomes available on the International numismatic market. 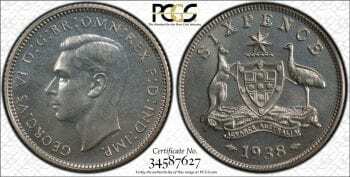 All coins are graded PROOF 64 by The Professional Coin Grading Service- PCGS. The Right Note acting on behalf of our client, are selling the coins as a collection. The collection itself, has been maintained as four coins for generations up the present time. 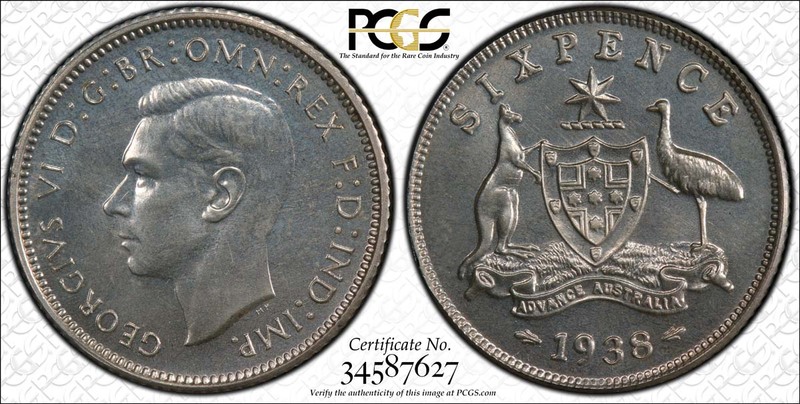 It is not a collection drawn together over various purchases hence the consistent grading of the coins of PR64. This is the collection for the discerning collector/investor looking to add to their numismatic portfolio. Current annual capital growth since from 2009 to 2018 has been an amazing 66.0% including- Accounting for the purchase of such a rare collection/collectively. 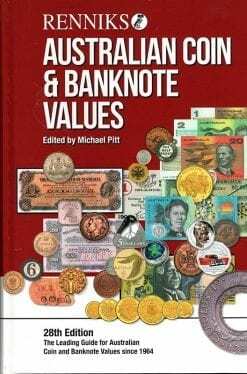 Source Renniks Coin & Banknote Catalogue 2009-2018. Note: Past performance is not an indicator of future capital returns. 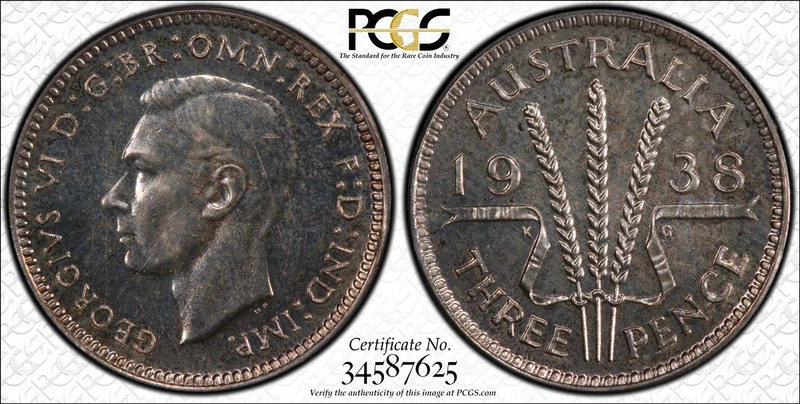 The joy of owning a wonderful part of Australian history, being expressed in owning Pre Federation and Pre Decimal coins. Along with this satisfaction should always come with an anticipated annual capital return on any investment. 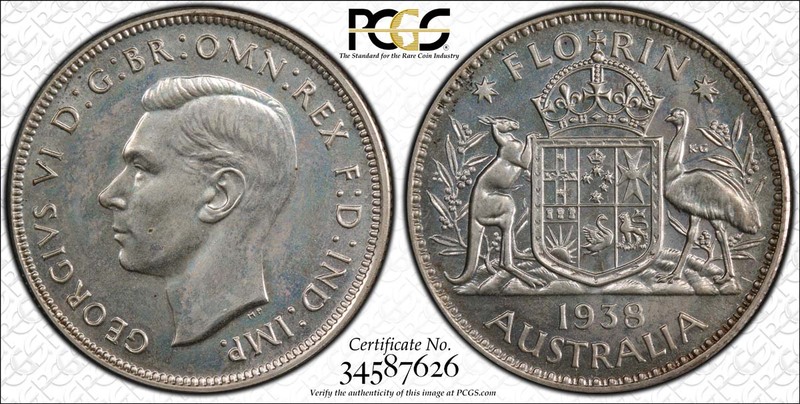 Proof Coins of any Australian era will be expensive far more than a Brilliant Uncirculated coin. Therefore the grading of this collection was paramount to The Right Note before marketing @ www.therightnote.com.au. TRN spent considerable time on the research of the collection, when completed we sent the collection to be graded and slabbed by PCGS. Their findings ensure the coins authencity beyond reasonable doubt. This lays the foundation for the purchaser to make an informed decision of their purchase based on authentication of grades, with provided annual capital return. Over 23 years we have seen a gradual growth in retail sales of all Australian/International coinage. Leading to 2015-2017 an emergence of these coins in interest and sales to record levels. 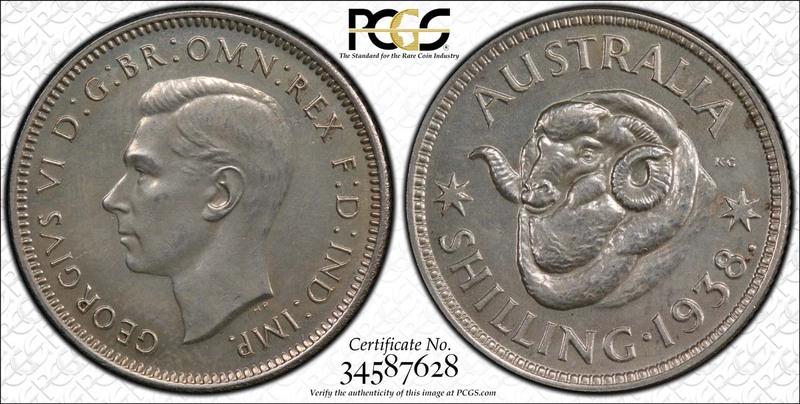 Summary: The 1938 Pre Decimal Collection graded Proof 64 have an audited mintage of 250 coins per denomination. Such an extremely rare set has not been sold/auctioned for generations. PCGS Authentication numbers are attached for of the four coins. All verifiable by going to PCGS.com under certified numbers, if you need my assistance with this part of the sale please contact me. TRN offer this extremely rare as four(4) coins, the set. OR as individual coins. Individual Coin Prices are as follows. Private viewings can be arranged in Sydney for genuine buyers. Prior to purchase.